How Good is a Wireless Smart Home Automation System? Can I do a whole wireless smart home system? Can I have a wireless home theater? We’re often asked, ‘how good can a wireless Smart Home Systems really be?’ Our answer, they can be AWESOME! Sure, given the option there are items I would always prewire, but if thats not in the cards you can have a banging good Smart Home that’s completely wireless. And for clarification, ‘Wireless’ doesn’t mean your Home Wifi Network. It means that the equipment communicates without wires using a proprietary wireless technology like Bluetooth, WiSA, ZigBee, or Z-Wave. Lets look at several of the components of a full Smart Home wireless system. We’ll start with the items that usually surprise clients the most. Yep. That’s right. You can have a fully wireless home theater. Even the projector can be wireless. This one surprises people more than any other wireless application. A wireless HDMI adapter is used to send the Video from the Surround Receiver to the Projector, and the video looks really really good. Just remember you still need an outlet for the Projector. There’s a number of wireless surround sound options. Currently we carry Sonos, Klipsch and Paradigm. Wireless systems for a 5.1 surround start around $2,500. Klipsch’s Reference Premiere HD Wireless Speakers are even capable of 7.2 Surround. These speakers are the real deal. There’s a good chance they’ll sound better than your friend’s hardwired speakers. A popular feature with Smart Homes, is the ability to control TVs and Video Sources (Blu-ray, Apple TV, Satellite/Cable Receivers, etc) from your Smart Home app. Traditionally this had to be hardwired during construction. Today, companies like Savant and Control4 offer a wireless controller that can be placed near each TV. This wireless controller gives you full control of the TV and its video components. You can finally get rid of all those remotes! See also: What is Entertainment Control? Clients are often surprised to learn that lighting control is already wireless. Most Smart Light switches are simply hardwired switches with a wireless sensor on board. Simply change your existing light switch, with a Smart Switch, and you’ll be able to control the lights wirelessly from your Smart Home app. And of course if you have a preference to the wireless lightbulbs, that’s an option too. You can now buy Wireless Shades, that use batteries for power. Typically the shades will run up and down, twice a day, for three years, before you need to replace the batteries. Some shades now even have the ability to recharge the batteries like you would your smart phone. These shades are so reliable, we regularly use them in new construction, but they’re especially great for Wireless installs in existing homes. Most people know that Security can be wireless, but in the past it was difficult to integrate Security Systems. 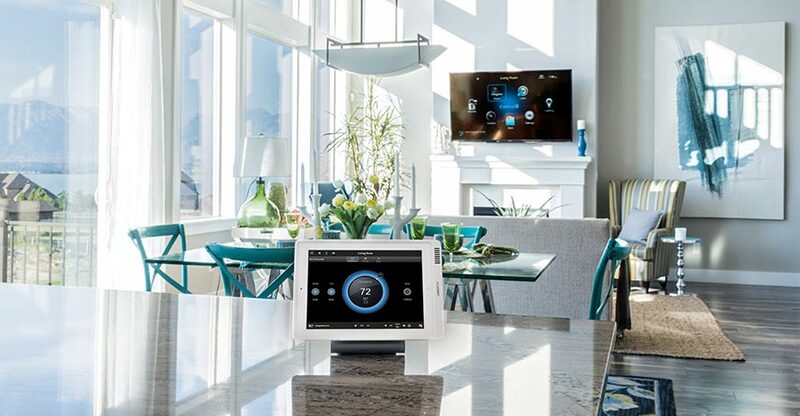 A smart home platform like Control4 or Savant required a hardwired connection to the Security System for integration. Today the integration can happen wirelessly. There’s also great wireless solutions to round out the security of your home for Cameras, Garage Door openers, and more. Smart homes make the performance of the home wifi increasingly important. Wireless Access points, (also called Hotspots) aren’t new. But new solutions like Eero, make it increasingly simple and affordable to expand the wifi coverage in your home to adequately cover you. The beauty of all Smart Homes, but especially wireless Smart Homes, is the scalability. You can start as small as you want, and scale the system as large as you want. And…. you can scale the system on your budget, and your timeline. If you ever move, you can sell the system with the home, or take it with you to the new home. Each of the categories we just covered is expandable one unit at a time. You can flush out one category like Home Audio, or you can do a little of each category at once. Decide where you want to begin. Are you ready for a kicking Surround Sound? Maybe you want lighting control. Maybe you want good tunes throughout the house. It doesn’t matter. Wherever you want to start, start there. What’s important is to try and purchase wireless solutions that all work together as your system grows. We’d love to hear your feedback, and any questions you have about your Smart Home Project. Contact us at TYM today for a free consultation. Or visit THE SMART HOME PROJECT™ and start designing your system.